Posted by Sebastian Gross on Juli 7th, 2014 . Now imagine you have 90.000 of those entries, so copy & paste is not something you want to do. You can easily achieve this using very simple regular expressions, all you need is an editor which supports this functionality like Notepad++ (which I’m using in this example). 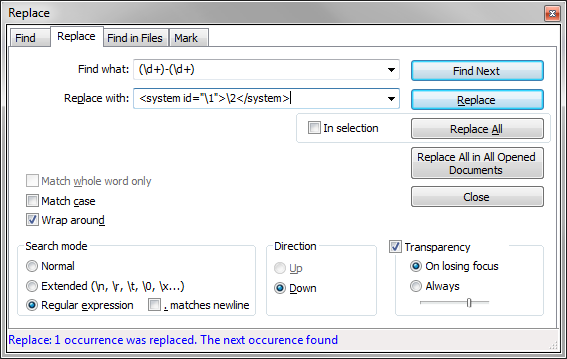 Make sure you select „regular expression“ at the bottom. 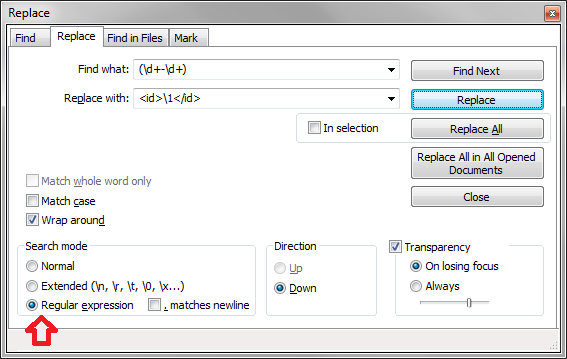 Now you can define a regular expression in the „Find what“ textbox. In my case I’m looking for a undefined amount of numbers \d+ until a minus – occurs and then again for a undefined amount of numbers \d+. By wrapping this expression in braces () you make the result available to the „Replace with“ textbox. Now we can use the first result \1 of the find-query above to place it inside the „Replace with:“ text. As you can see we have two results inside the „Find what“ query, we separate the digits before the minus from the ones after the minus and use the frst entry for the value of the id-parameter and he second for the value of the system-tag.